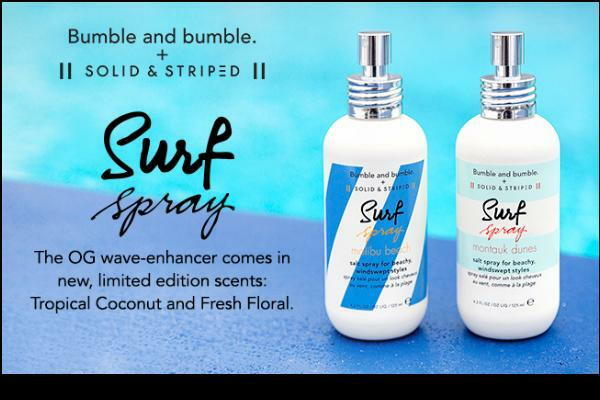 In 2001, Surf Spray set the standard for beachy hair – ie., styles that mimic the saltwater-soaked, sun-dried, untamed textures you get after a day by the sea. With one spritz, windswept waves were instantly a shore thing. Now, in partnership with Solid and Striped (a chic swimwear brand), we’re launching two limited edition Surf stylers – each infused with a sea-sprayed scent celebrating the iconic American beach vibes found on each coast. Surf Malibu Beach – a Coconut, Orange, and Red Fruits-spiked tropical scent – embodies that lush-yet-laidback Cali thing (think eensy bikinis, palm trees, and bonfires). Surf Montauk Dunes – a Lily of the Valley and Dewy Greens-blended floral scent – celebrates the preppy personality of this New York seaside enclave (think naval stripes, reedy grass, and chic seafood shacks).